Home > News > The first newsletter of the European Observatory for Clusters and Industrial Change (EOCIC) is out! 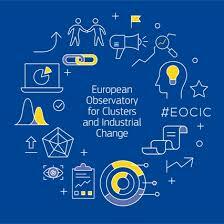 We are very pleased to introduce to you the first edition of the European Observatory for Clusters and Industrial Change (EOCIC) newsletter, which follows up from the previous European Cluster Observatory. The aim of this publication is to provide, twice a year, a summary of the latest activities of EOCIC, as well as other cluster related activities undertaken. This edition is dedicated to the key evolutions of the Observatory, including an update on its goals and services, and provides a summary of the latest outcomes of a number of conferences discussing European, national and regional cluster policy that took place in the past months. You can read the whole newsletter in the attachment.